Probably the best thing about all of this has been his reaction. It's like a slow-motion version of his "do it live!" meltdown. At this point, it should be obvious to any reasonable, rational observer that Bill O&apos;Reilly&apos;s growing roster of lies far outpaces Brian Williams&apos; Chinook helicopter story. Yes, Williams is a news anchor and should be held to a higher standard than a cable news polemicist like O&apos;Reilly. Then again, O&apos;Reilly&apos;s lies are more outlandish and bizarre -- and getting more so every day. On Tuesday, Media Matters uncovered what could be the most ludicrous and insane O&apos;Reilly tall-tale so far. Only O&apos;Reilly could invent something as obscure and as genuinely weird as this one. Brace yourself because it involves the assassination of President Kennedy. 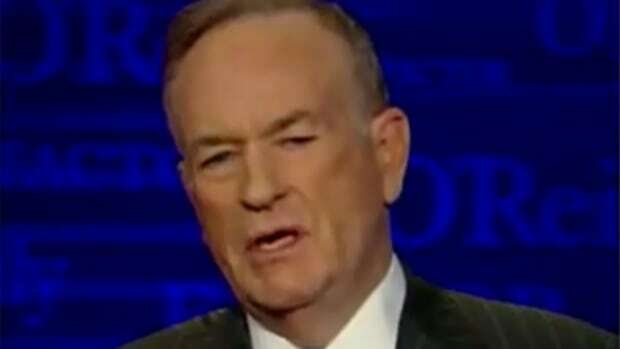 No, O&apos;Reilly didn&apos;t claim to be on the grassy knoll in Dealey Plaza. This is considerably stranger. One of the central figures in the background of the JFK assassination is a man named George de Mohrenschildt, a well-connected Russian émigré and associate of Lee Harvey Oswald, who himself happened to have been fluent in Russian. Reports indicate that de Mohrenschildt secured a job for Oswald in Dallas at the Jaggars-Chiles-Stovall photographic studio. De Mohrenschildt also told the Warren Commission that he and his wife saw Oswald&apos;s rifle during a visit to Oswald&apos;s house. 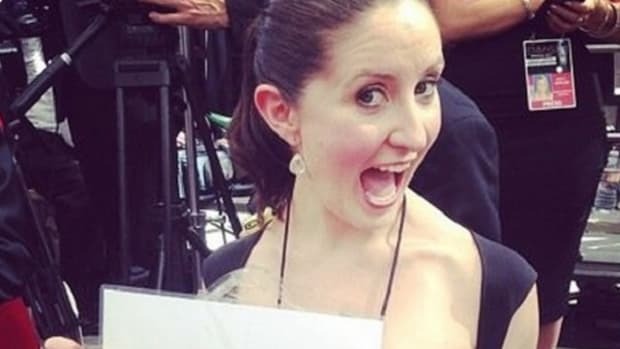 Following the assassination and after returning the U.S. from a stint in Haiti, de Mohrenschildt&apos;s daughter died and he evidently became increasingly erratic, at one point writing to then-CIA Director George H.W. Bush requesting to have the taps removed from his phone and for agents to stop following him. Bush replied and, naturally, denied the government&apos;s involvement. Bush went on to theorize that the suspicious activity was related to home grown JFK investigators interested in de Mohrenschildt&apos;s friendship with Oswald. In 1977, after his wife was committed to a mental hospital, and just before he was scheduled to testify before the House Select Committee on Assassinations, George de Mohrenschildt put a shotgun to his head and blew his brains out at his daughter&apos;s home in Florida. And here it is. 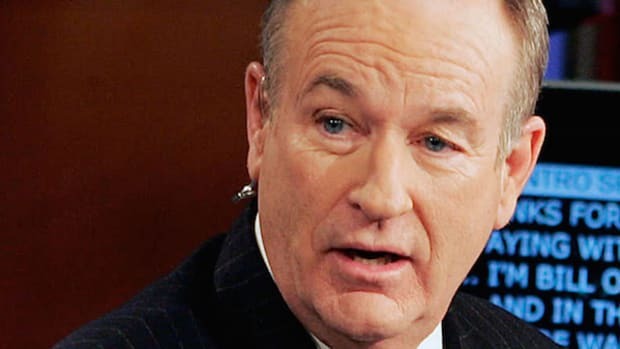 Bill O&apos;Reilly has repeatedly said he was outside the house when de Mohrenschildt committed suicide, going so far as to say he heard the gunshot. 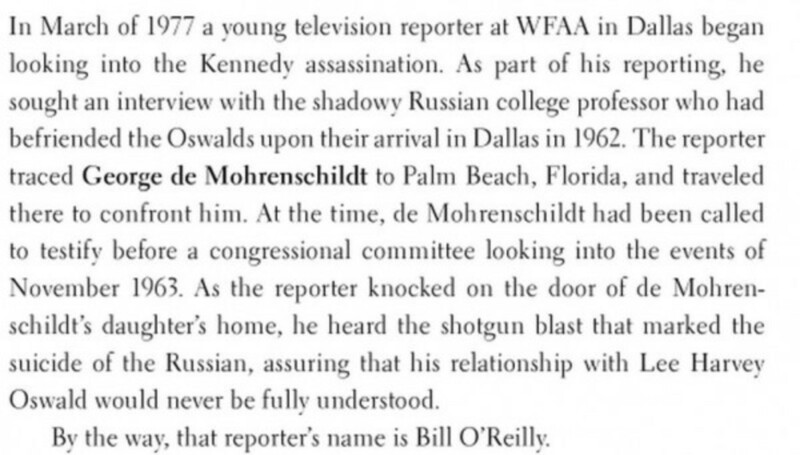 Yes, The Bill O&apos;Reilly while he was a 20-something reporter for Dallas TV station WFAA was within earshot of de Morhenschildt&apos;s suicide. However, and predictably enough, Media Matters noted that on at least three occasions O&apos;Reilly has repeated this story -- a story that turns out to be totally untrue. 2) Kennedy&apos;s Last Days and the Killing Kennedy audiobook. 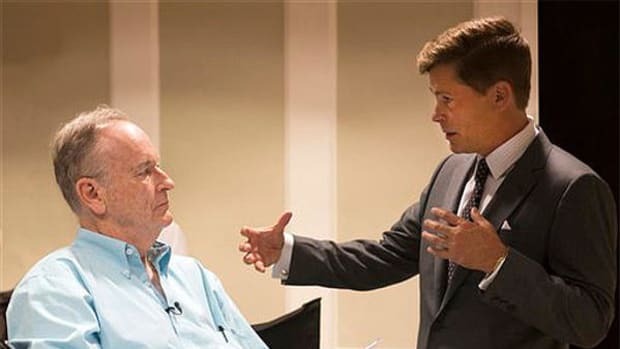 As Media Matters reported, it also appears in the audiobook as well as the junior version of Killing Kennedy, titled Kennedy&apos;s Last Days, in which O&apos;Reilly wrote: "As I knocked on the door, I heard a shotgun blast. He had killed himself." "I was about to knock on the door where [de Mohrenschildt] was, his daughter&apos;s house, and he blew his brains out with a shotgun." Unfortunately for O&apos;Reilly, no one else seems to corroborate his story. 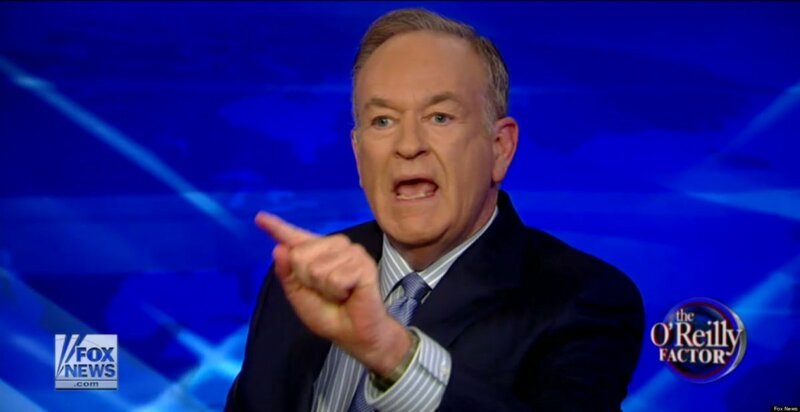 --Former WFAA colleague Tracy Rowlett: "Bill O&apos;Reilly&apos;s a phony, there&apos;s no other way to put it. He was not up on the porch when he heard the gunshots, he was in Dallas. He wasn&apos;t traveling at that time." And, "I don&apos;t remember O&apos;Reilly claiming that he was there. That came later, that must have been a brain surge when he was writing the book." He added, "It was my experience with O&apos;Reilly that he was less than an honest reporter, generally. He was the most disliked person in our newsroom. 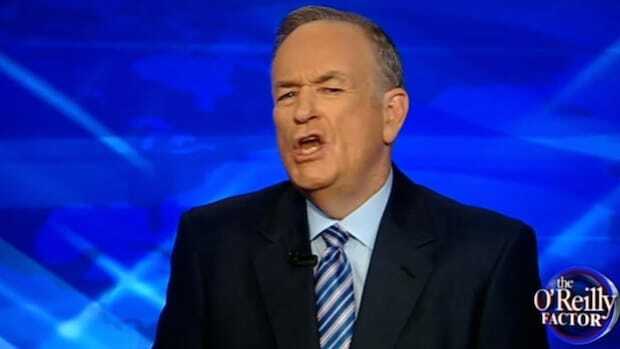 He wasn&apos;t to be trusted, he was all about Bill O&apos;Reilly, he wasn&apos;t about the news." 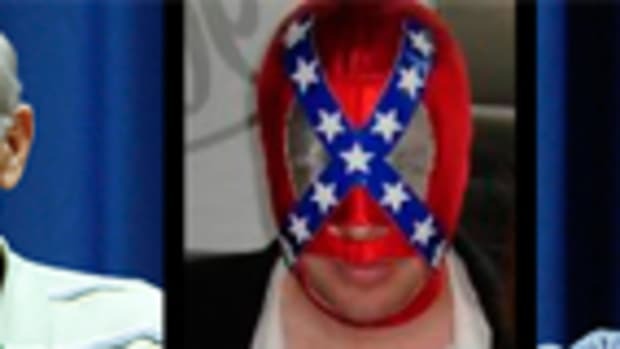 --Another WFAA staffer at the time, Byron Harris: "He stole that article out of the newspaper. I guarantee Channel 8 didn&apos;t send him to Florida to do that story because it was a newspaper story, it was broken by the Dallas Morning News." And, "[It] would have reported it as some kind of exclusive -- and there was no exclusive -- if O&apos;Reilly had been standing outside the door." --Former editor for The Washington Post and noteworthy JFK assassination writer Jefferson Morley said O&apos;Reilly&apos;s story is "not true" and, "It is what these guys all do, they inject themselves into a dramatic situation. O&apos;Reilly was chasing this story, but he wasn&apos;t there, he made it sound like he was more on the scene than he was, it was show business." --The Palm Beach County Sheriff&apos;s report on de Mohrenschildt&apos;s death doesn&apos;t mention O&apos;Reilly at all, even though it probably would have since he was presumably the only witness to hear the shot. The report also noted that the only people at the house were two maids and neither heard any gunshot at all. --JFK author and investigator, the late Gaeton Fonzi interacted with O&apos;Reilly at the time and O&apos;Reilly never mentioned anything about being there. For what it&apos;s worth, I&apos;ve read Fonzi&apos;s book in which he claims the president&apos;s body was switched with a body double after landing at Andrews Airforce Base the night of November 22, 1963. While thoroughly investigated, the claim doesn&apos;t hold water. Regardless, Fonzi wrote in 1993 that he received a call from O&apos;Reilly the night of de Mohrenschildt&apos;s death and it was O&apos;Reilly who told Fonzi that de Mohrenschildt committed suicide. Not a word about witnessing it or even being in Florida. Jefferson Morley, meanwhile, has tapes of conversations between Fonzi and O&apos;Reilly in which O&apos;Reilly explicitly states that he was in Dallas pursuing the suicide story. Yeah, so, screwy enough for you? Probably the best thing about all of this has been his reaction. It&apos;s like a slow-motion version of his "do it live!" meltdown. 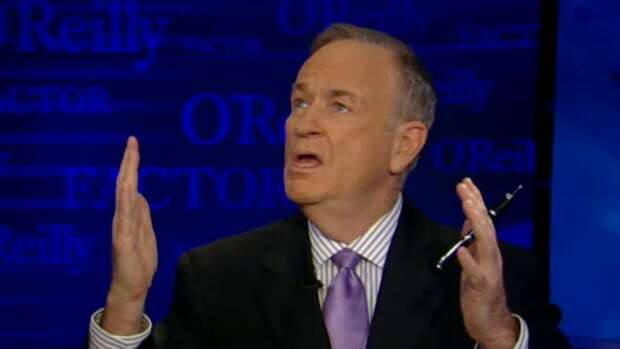 There&apos;s nothing quite as funny to me as watching O&apos;Reilly get all outraged and flustered. He&apos;s a 12-foot-tall clown with a ridiculously short fuse, and whenever he loses his cool like this, it&apos;s like watching a bully stomp around with a streamer of toilet paper unknowingly stuck to his shoe. So, please keep digging these up. I&apos;ll make the popcorn.